ABB, a power and automation technology group based in Switzerland, announced that it has been selected by Fastned to supply chargers to more than 200 electric vehicle (EV) fast-charging stations in the Netherlands, bringing an EV fast charger within 50km of all of the country’s 16.7 million inhabitants. 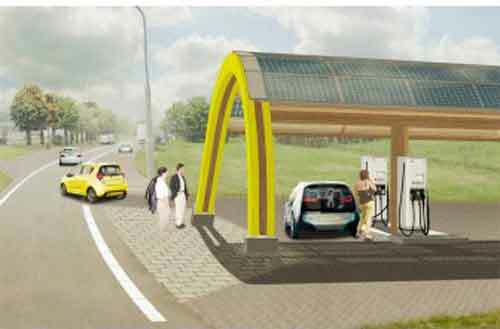 Fast-chargers will be located a maximum of 50 kilometers apart along all highways. ABB notes that its multi-standard design will be able to serve EVs offered by all major car brands from Europe, Asia and the US with different fast-charging standards and protocols such as CCS and CHAdeMO. Its open standards-based cloud connectivity solution also allows Fastned to create a user-friendly payment and access service for all drivers. Each web-connected ABB fast charger has a wide range of connectivity features, including remote assistance, management and servicing and smart software upgrades to maintain reliable service and to upgrade its network, according to the company.